Estimated 36-hour Trip with a scheduled departure at 6:00am and return the following day at 6:00pm. On the way out anglers and the Shady Lady crew will troll for Wahoo and King Mackerel. 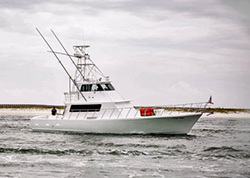 We will then stop at deep-water spots and fish for Scamp, Grouper, and Amberjack. 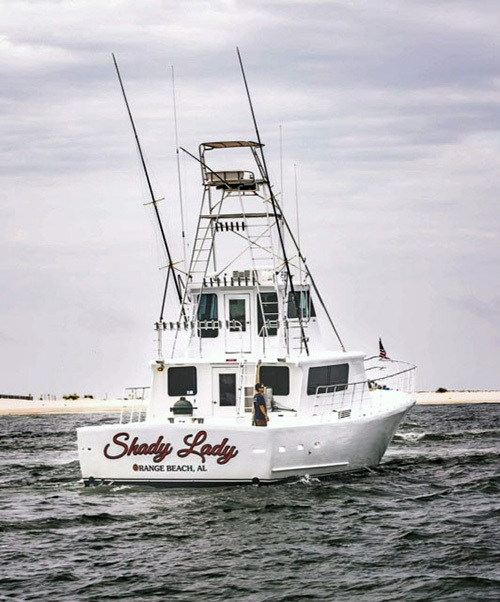 Depending on the water and fishing conditions, we will arrive late afternoon at one of the many deep-water rigs and attempt to catch big game fish like Tuna, Dolphin, Wahoo, or even Marlin. Once the “bite” has ended, we can prepare to settle in for the night. After a long day of fishing and a good cooked meal on the Green Egg, anglers can jig for Black Fin Tuna, while the crew sets out Swordfish rigs and begin chunking hoping to hook up Larger Yellow Fin Tuna. Anglers can continue to fish through the night. As the sun begins to rise we will start troll or kite fishing. While making our way back to port, we can finish the day off bottom fishing for eight different types of fish such as: Snapper, Trigger Fish, Grouper and etc. Kick back, relax and enjoy the ride back to port. Standard charter service such as: fuel, bait, and tackle, including big game equipment. Sleeping accommodations includes pillows, sheets, and blankets. Large hot water shower is available and is equipped with soap and clean towels. Food such as: Conecuh sausage at breakfast: fresh fish, hamburgers or hot dogs for lunch and dinner. Feel free to bring your own grill foods as well. Gratuity is not included and is 20% of trip price, please show your mates you appreciate them by tipping accordingly. Fish cleaning is not included in the trip price but offered by the crew at a rate of $.30 per pound whole fish weight. Alcohol consumption is allowed but is asked to be kept at a minimum due to the length of the trip. Please contact us at anytime for any questions or concerns. A-1 custom fiberglass boat with 3 staterooms, 2 baths and a full walk-in shower. Salon area is large and open with plenty of extra seating. Fuel capacity is 1,200 gallons and a fresh water capacity of 300 gallons. The Shady has a high volume icemaker, freezers, and 3 air conditioners to allow maximum comfort. Fishing is allowed from the bow due to a certified bow rail system. The Shady is Coast Guard inspected yearly and is equipped with all required emergency and rescue life rafts. For extra comforts while offshore we have installed a satellite radio, TV/VCR/CD, and a satellite phone for emergencies.